“Give thanks at the remembrance of His holiness” (Psa 97:12). Please observe, it doesn’t say, ‘Give thanks at the remembrance of His goodness’ or ‘Give thanks at the remembrance of His blessings’ but, ‘Give thanks at the remembrance of His holiness.’ So, if you cannot thank God with a grateful heart, it is not that God has not done any good things for you, but that you don’t love holiness. Holiness is His goodness. If you can enjoy God’s holiness now then you can enjoy God’s goodness for all eternity. The Psalmist says, “I had fainted, unless I had believed to see the goodness of the Lord in the land of the living” (Psa 27:13). The Psalmist would have been discouraged had he not believed to see the goodness of the Lord. 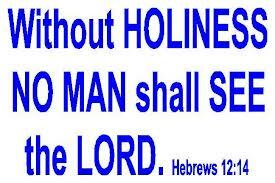 One goodness of the Lord is the holiness of God. Of course, the Psalmist did not fully experience the holiness of the Lord, but he believed that a holy life is possible. That was the reason why he turned to the Lord with a broken heart and confessed his sins to the Lord – as we find in Psalm 51. The simple truth is that, if you don’t believe to see the goodness of the Lord or the holiness of the Lord in your life, one day you are going to faint or be discouraged. Holy people will never be discouraged as they will be enjoying the fulness of the goodness of God in the land of the living. In fact, one saint says that a holy life is “Canaan flowing with milk and honey”.